Wireless Internet means you receive your Internet connectivity through a wireless CPE (Customer Premises Equipment) on your roof. This CPE points to our nearest tower to connect to Internet and other services. A constant high speed Internet connection is far more valuable than a connection that is unstable. Optimized specifically for business use. Fantastic support via our call-center, backed up by local technicians. The problem with Internet in South Africa is related to old infrastructure. 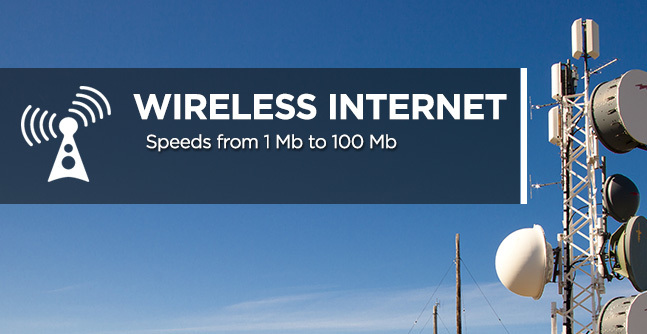 Wireless Internet Service Providers advertise high speed and uncapped Internet. When you test the service, however, you find it mostly slow with fast speeds very late at night. This is because most Internet Service Providers in South Africa jumped on the bandwagon, trying to please everybody and in turn pleasing nobody. To provide high speed Internet, most providers contend (share) the Internet feed with too many other consumers. This slows your Internet down just like a massive highway full of cars in a traffic jam. Your connection is slow because it is part of the data traffic jam. They optimize their network for market share, not performance. A network optimized specifically for business use. We at Oc2Tech IT Solutions understand how to manage our network so your Wireless Internet connection is always fast. We achieve all the above criteria to provide your company with an Internet connection that will allow your business to increase in productivity and profitability.